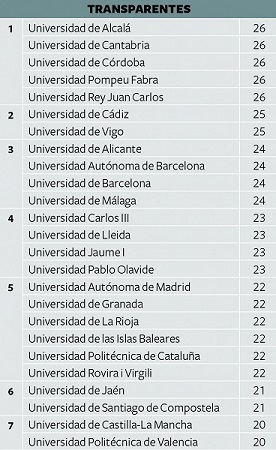 The University of Alicante has managed to become the most improved Spanish university in the transparency ranking according to the yearly ranking published by Fundación Compromiso y Transparencia. In just one year, it has risen to third place in the ranking on transparent universities. "In fact, we had practically all the information requested by the different indicators of this foundation's ranking, although it was not organised and centralised the way they asked, which made us be ranked in a position that did not adjust the reality of our institution", UA Vice President for Quality Standards & Educational Innovation Francisco Torres explained. He added that «we have seen this ranking as an opportunity to put all this information together and update it in the way they ask , which has allowed us to climb up so many positions so as to appear among the most transparent universities in the country". 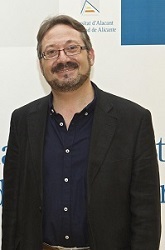 The University of Alicante created an Internet Open Data Portal three years ago with all the university information accessible and reusable, "the latter being crucial for open data so that third parties can use it freely in a way that if we offer, for instance, information on our degrees, fees, access or marks, an app can be developed to use this information". According to Francisco Torres, "Transparency is nothing but an expression of mutual trust among institutions and citizens, which we take very seriously working crosswide over all the institution's areas. However, even though we know that we can always get better, this Foundation's ranking has served us as an incentive to improve some aspects. This is the way we have done it and the results obtained show a much improved reality of transparency in our University". The Fundación Compromiso y Transparencia ranking works with 26 different indicators including data related to university governance, activity, satisfaction, research and degrees, among others. However, its main interest is economic data. Universities cannot be included in this transparency raking without having their financial statements and audit reports published. The University of Alicante meets 24 out of the 26 indicators of the foundation and expects to meet them all next year. "We have worked hard with all the university main offices and services in recent months to organise all the information and update missed data. Most of the information was already available. The only thing we have done is to reorganise it". The goal now is to stay high in the ranking trying to improve those indicators regarding the university teaching staff, as Torres reported. According to the Vice President, "it is our responsibility to notify all the activity generated within the University in order to make it accessible. I do not mean that it was not accessible in the past, but the current concept makes access to information easier without having to ask for it". In this sense, one of our challenges is the automation of the whole process since most of these data are being proceeded manually for the time being. The information is available in several offices and we work on implementing a system that is able to reuse this information automatically into the Open Data Portal, which would significantly improve efficiency in this field. Since it came into force, the University of Alicante has faithfully complied with the Transparency Act, Torres said. What is new here is the visibility of the work and the indicators, that is to say, "in the way the information is displayed". Therefore, it has been less than a year that the University has implemented its Regulations on Transparency, although both the content and the Open Data Portal need to be improved, for which purpose we have a technical committee and an executive committee. "These two committees are in charge of defining the transparency policy of the University of Alicante and there we are working to keep on improving", Francisco Torres states. Image: UA Vice President Francisco Torres, in charge of Quality & Education Innovation.